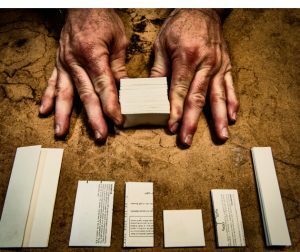 Folding Services - Steve's Bindery Service, Inc.
Folding is just one of the finishing services offered by Steve’s Bindery Service, Inc. Our high-speed folding options can help save you time and money. Imagine trying to fold 5,000 letters! Some of the common projects for which we fold include letters, invoices, brochures and direct mailers. There are many specialty foldings, and we can fold your materials in virtually any way you need. 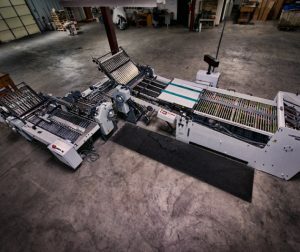 We utilize four folding machines at Steve’s Bindery Service, Inc.: the Stahl B-30, the Stahl B-26, the Stahl B-20 and Baum 500. The Stahl B-30 and B-26 folders feature continuous feed buckle plate folders with a 32-page capacity. The Stahl B-20 folder is a buckle plate folder with a right angle. The Baum 500 has four plates up and down and can cover about any folding need our customers might have. Each piece of equipment is maintained to the highest standards. This helps prevent equipment breakdowns or malfunctions and results in higher quality finished products. At Steve’s Bindery Service, Inc., our 16,000 square foot plant is kept meticulously organized. All areas are cleaned thoroughly after each job is finished, helping our bindery staff work at maximum efficiency. Before each job, we review the materials. We look carefully for missing or incorrectly numbered pages and other mistakes. Only after the first finalized copy is checked for perfect alignment, bleed and other quality measures do we begin a full run. We watch consistently for potential problems with processing and will stop the job immediately to allow a customer to make corrections, if need be.